How Can You Control Moisture? SaniDry™ Basement Air System, with air filtration is one of the best dehumidifiers that money can buy. The short answer is a dehumidifier. A dehumidifier will take moisture out of the air. This will lower the overall humidity and make it much harder for dust mites, mold, and mildew to cause you problems. We would recommend the SaniDry™ Basement Air System for the best results. This high capacity high-efficiency system puts most competition to shame and we have found the most consistent results using it. 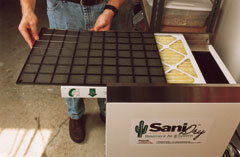 The SaniDry™ is a high-capacity, high-efficiency dehumidification system, with air filtration, in a single unit. The SaniDry™ takes up to 100 pints of water per day out of your basement air, while using the same energy as a "40-pint" dehumidifier. And it filters particles out of the air to less than an incredible two microns in size - which is smaller than any mold spore or dust mite dropping. The SaniDry™ Basement Air System wrings your air dry, and its powerful blower moves that dry air out into and around your basement space. This dry air then dries your building materials and basement contents, which makes the damp smell and damp feeling go away! What a huge difference a SaniDry™ can make in "condensation season." People really love their dry basement environments after having a SaniDry™ installed.